Our scholarships offer access to the opportunity of education, assisting promising students to fulfil their potential. We partner with higher education institutions across Australia to offer substantial scholarships that recognise talent, leadership potential and commitment to the community. Through our fellowships and other education programs, the Foundation currently supports fellowships through The International Specialised Skills Institute, and places for secondary students in the Earthwatch Student Challenge program. 'I have discovered that my passion lies in the environment sector and in assisting the next generation to discover, grow and feed their passion in this field. 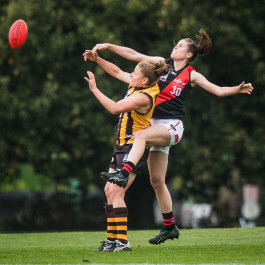 Simone has been kicking some serious goals, having made the transition from playing state and national netball to playing for Essendon in the VFLW.